Throughout the Middle East region last week, there was a spike in both demonstrations and remote violence events. For the former, the increase occurred most significantly in Iran, where wide scale economic protests continue, and in Israel, where people responded to the latest round of border violence with Gaza. That violence took the form of heavy rocket fire from both Gazan armed groups and the Israeli military following another breakdown in the ceasefire. In Syria, heavy regime and rebel shelling in the northwest also contributed to this spike in events. 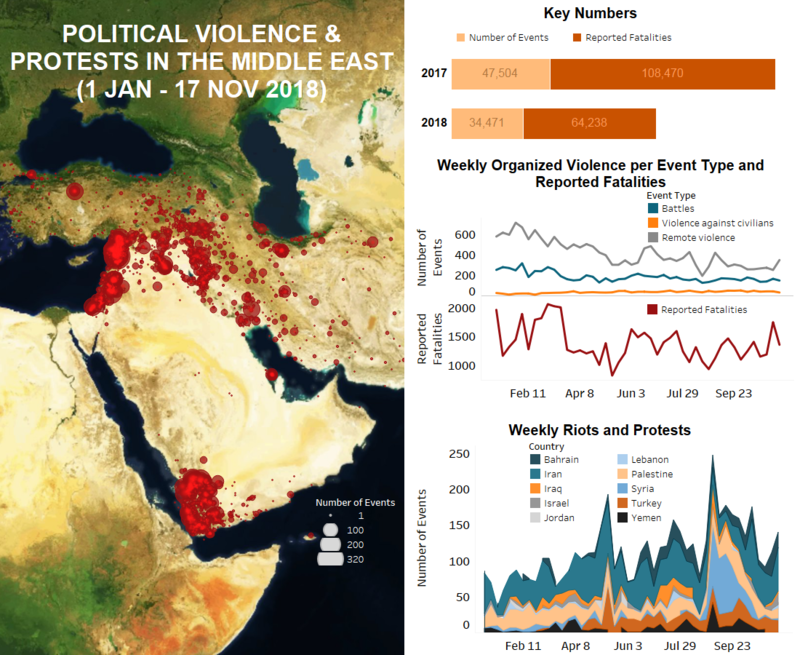 Meanwhile, the armed conflicts in Yemen, Iraq, and Turkey continued at similar levels to the previous week, while in Bahrain, the upcoming election continues to fuel violent unrest. In Israel and Palestine, there was the most significant escalation in border violence since the 2014 war (Middle East Eye, 13 November 2018) following a rare Israeli ground operation into Palestine on Sunday, 11 November. During the operation, an Israeli soldier and seven Palestinians, including a Hamas commander of the Izz ad-Din al-Qassam Brigades, were reportedly killed. Over the following two days, approximately 460 rockets were launched by Hamas and Palestinian Islamic Jihad (PIJ) into Israel, causing serious damage and injuring many Israelis. One rocket hit a residential building in Ashkelon, reportedly killing a Palestinian worker in Israel. Israel responded by targeting over 160 sites with airstrikes, allegedly killing eight Palestinians, injuring many, and causing damage to buildings across the Gaza Strip. By Tuesday evening, Palestinian armed groups announced a ceasefire with Israel which prompted large scale demonstrations from Israelis living in the territories adjacent to Gaza who believe Israel should take a stronger stance. The ceasefire also resulted in the resignation of the Minister of Defense, Avigdor Lieberman, who renounced the ceasefire as “surrendering to terror” (BBC, 14 November 2018). The resignation of Lieberman also means the withdrawal of his party, Yisrael Beiteinu, from the governing coalition, leaving it with a majority of only one seat. If any other party withdraws from the coalition, there will be an election. While the coalition has survived the week, experts say it is unlikely to survive more than a few months (New York Times, 19 November 2018). In Jordan, there were a number of protests in Amman led by taxi and bus drivers. Taxi drivers protested against the use of ride hailing apps, which are deteriorating the demand for taxi drivers and negatively impacting their business. Private bus drivers also protested in Amman against new government regulations which state school buses must be removed from service 20 years after their manufacturing date (Jordan Times, 14 November 2018). In Iran, hundreds of workers of Haft Tapeh Sugarcane Company continued their daily protests in Shush which started on 5 November. The workers are demanding months of unpaid wages and the addressal of issues within their industry, which has been struggling financially since it was privatized in 2015. Reports suggest that the company’s largest shareholder and director general is either on the run or has been arrested for violating the new strict regulations on foreign exchange transactions (Radio Farda, 9 November 2018). Furthermore, the second round of nation-wide strikes by teachers began in hundreds of schools across more than 50 cities in Iran. Following a call by the Coordinating Council of Teachers Syndicates in Iran (CCTSI), teachers refused to appear in classrooms and a staged a sit-in rally to demand higher wages, the release of teacher activists, and the improvement of education quality. Twelve teachers have been arrested, while 30 were summoned and interrogated in connection with the strike (Radio Zamaneh, 15 November 2018). In Bahrain, demonstrations continued last week, mainly by groups calling for the boycott of the upcoming 24 November elections, but also in response to the recent death sentence handed down to four Shiite citizens for a 2017 bombing that killed a policeman (France 24, 12 November 2018). In Turkey, Kurdistan Workers Party (PKK) media reported clashes with Turkish troops and claimed that the group conducted missile attacks on Turkish bases in the provinces of Sirnak and Hakkari. They also claimed responsibility for an explosion last week in Hakkari province where seven soldiers were reportedly killed, although the government continues to report this event as an accident (Kurdistan 24, 11 November 2018). However, the majority of events in Turkey were demonstrations, centered in Ankara. Among the protest groups were former government employees who were fired under a series of emergency laws passed by President Erdogan during the post-coup state of emergency. These protests have continued almost daily for months. In Iraq, battles and remote attacks occurred in similar numbers to the previous week, with the majority of events taking place between Islamic State (IS) militants and government troops or their allies. In the north, a Turkish military airstrike reportedly killed 14 PKK fighters in the Qandil mountains of Erbil governorate. In Yemen, Coalition-backed forces continued to battle pro-Houthi forces in the port city of Al Hudaydah, with high casualty numbers being reported. Estimates from the data suggest that over 500 fatalities have occurred in the city since the first of the month. There was a slight lull in the fighting following a negotiated truce early in the week, however this agreement was largely ignored by the warring parties. Meanwhile, assassination attempts were made against multiple high-ranking security officials in Aden city (see this recent ACLED piece on assassinations in southern Yemen), and in the eastern governorate of Mahra two people were killed after armed clashes erupted between locals and Saudi military forces following a dispute at a checkpoint. In Syria, there was a slight rise in violence last week which may signify a widespread intensification of the conflict. Among the areas experiencing an increase were the two major battle regions in the east and northwest of the country. In the east, Syrian Democratic Forces (QSD), along with their Global Coalition allies, continued their offensive against the Islamic State (IS) in Deir-ez-Zor governorate. However, new Turkish incidents – such as the alleged recruitment of opposition fighters in the northeast of Syria – along with the anticipation of newly arrived QSD reinforcements, have led the QSD to move forward at a more cautious pace. At the same time, Coalition bombardments of the area were particularly heavy, with separate incidents in Haijin, Sosa, Abu Hasan and Shafa amounting to over 80 alleged civilian casualties. In the northwest of of the country, high levels of both rebel and regime shelling occurred across the southern Idleb, northern Hama, and eastern Lattakia governorates. These attacks can been seen as either a response to the alleged failure by Islamist rebels to withdraw from the region as stipulated under the Sochi agreement, or as an attempt by actors to fortify their military positions in anticipation of a new round of negotiations – the Astana talks – scheduled for 28 November (Al Jazeera, 19 November 2018). Finally, in Rural Damascus, regime forces successfully recaptured the Tlul al Safa area from IS after three months of fighting. IS militants withdrew after regime forces took control of the volcanic plateau.